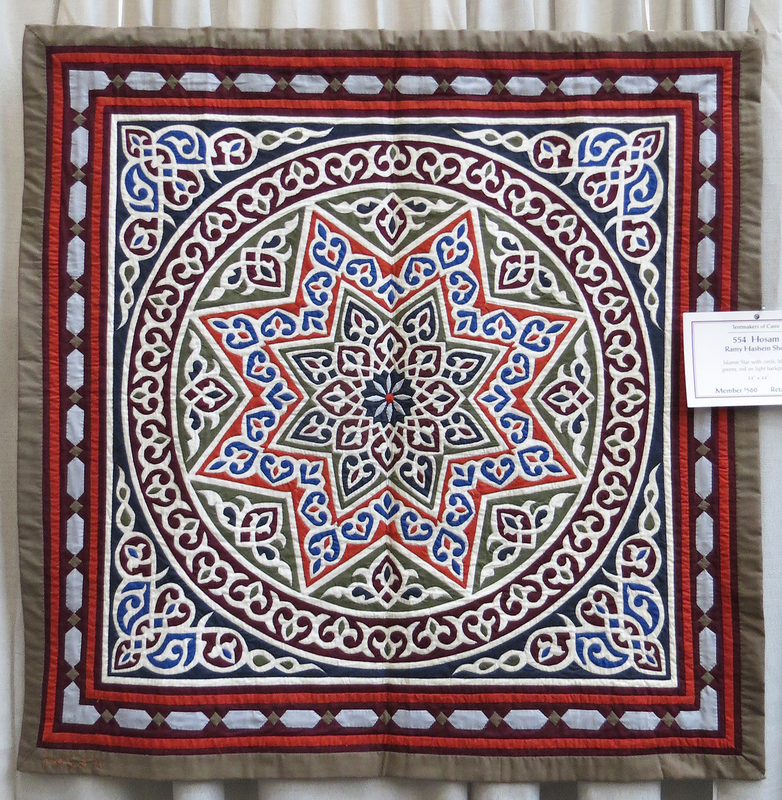 I had heard about the remarkable work of the Tentmakers of Cairo, men who ply the needle so expertly and with such great speed that they create a huge body of hand appliqued quilts unique to their region. Sadly, their work is not highly appreciated in their own country, but thanks to Jenny Bowker, Bonnie Browning and the American Quilters Society (AQS), word about their art is spreading. AQS also has committed to establishing a long-term market for these quilts in the United States. It was my first stop at the show. I began photographing the wide variety of quilts, all various designs in hand applique. 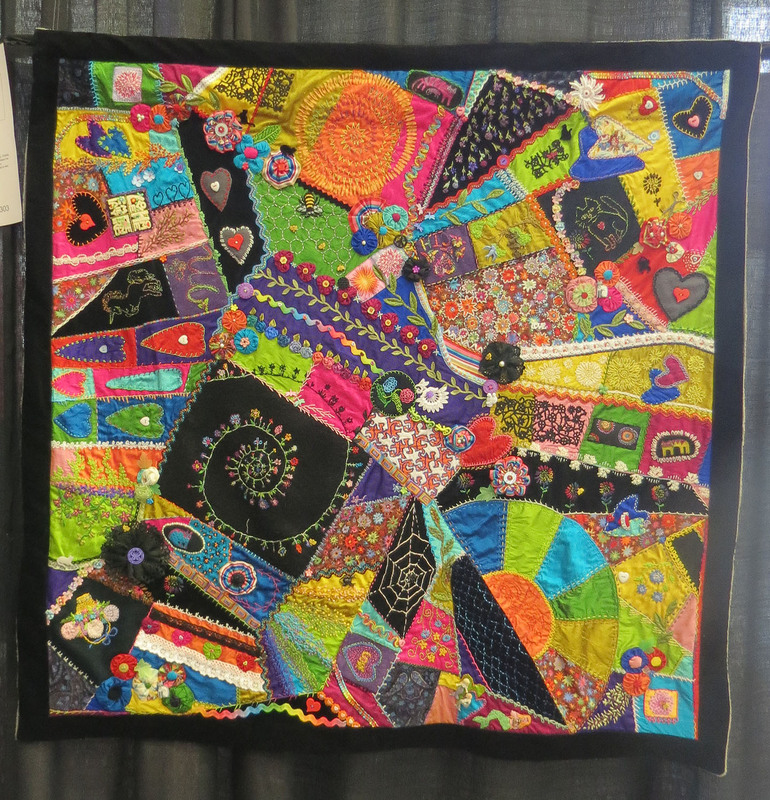 This large quilt caught my eye immediately and it also was positioned in the front of the exhibit. 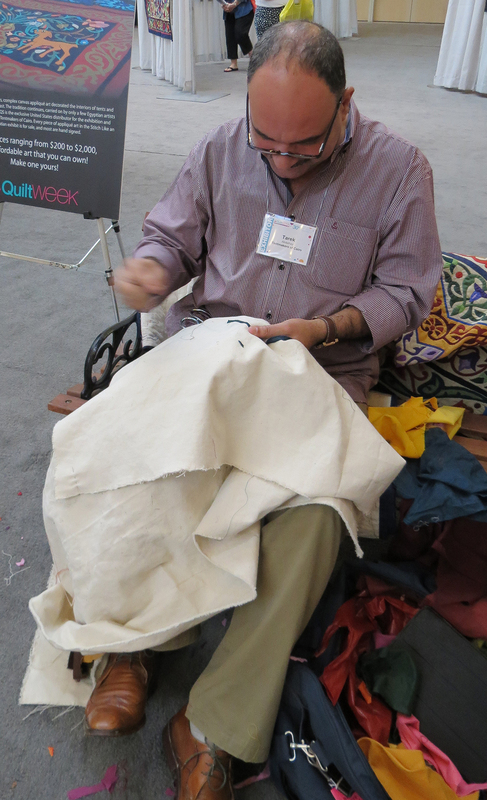 I also saw the empty bench in the middle of the display where Tarek Abdelhay was plying his needle. But, he was on his lunch break, which is precisely the only time that I could visit. So, I continued photographing. 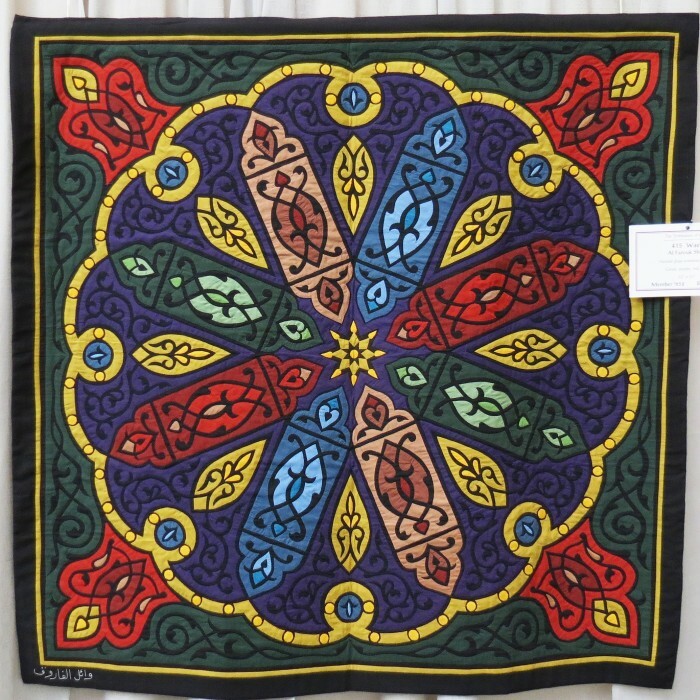 Some of the quilts were whimsical, like this one, and sizes ranged from quite small to bed size. 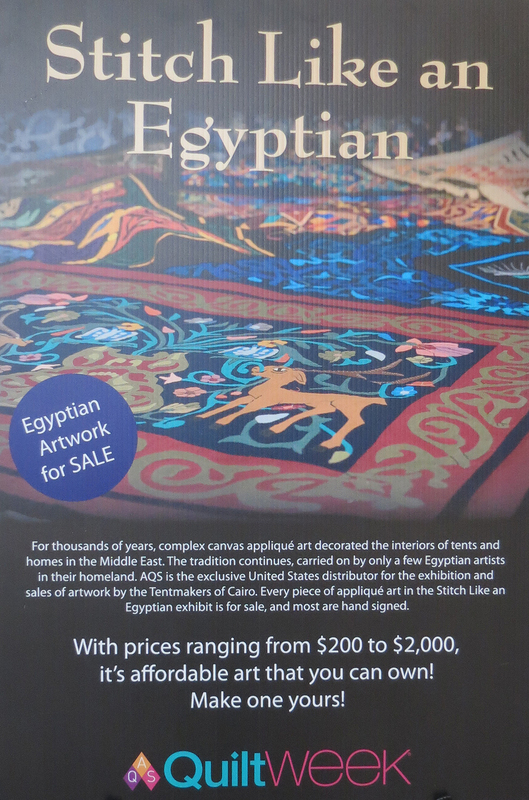 Prices ranged from $100 – $2,000 for the quilts, a bargain in my opinion. Among my favorites were the incredible Arabic calligraphy quilts. Some were so detailed it boggled my mind! Each was more beautiful than the last. But, my lunch hour was coming to a close, and I had to return to class. Darn! I planned to be back as soon as class ended. So . . .
A little after 4 pm, there he was! 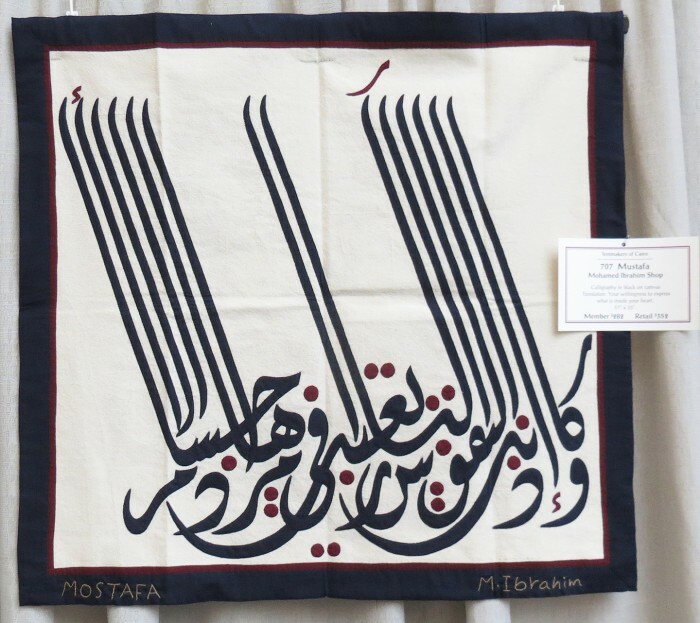 Tarek Abdelhay, one of the many appllique artists from Cairo, was there and I have never in my life seen anyone stitch so fast and so accurately. It was just as amazing as promised. And, he didn’t even use a thimble. I watched for a long time, gaining an even greater appreciation for the work in the display. I viewed the exhibit again, this time with awe. 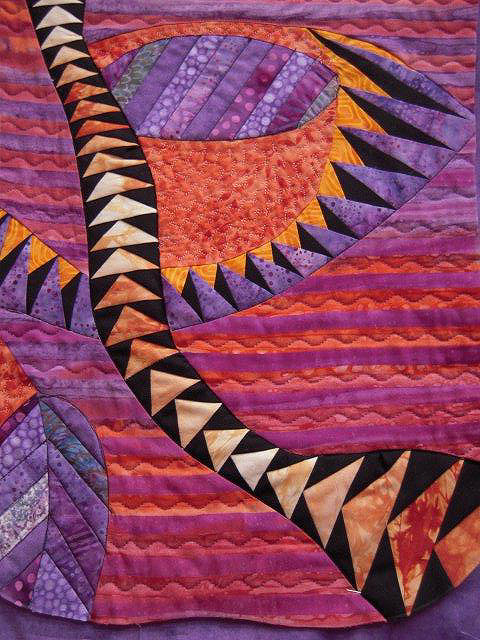 The next few quilts follow without my commentary – as no words can adequately portray the beauty of each. Such beauty! 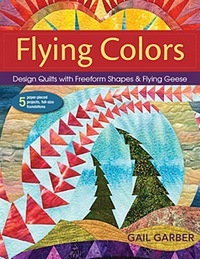 I bought the book about their work (it is available online from the American Quilters Society. 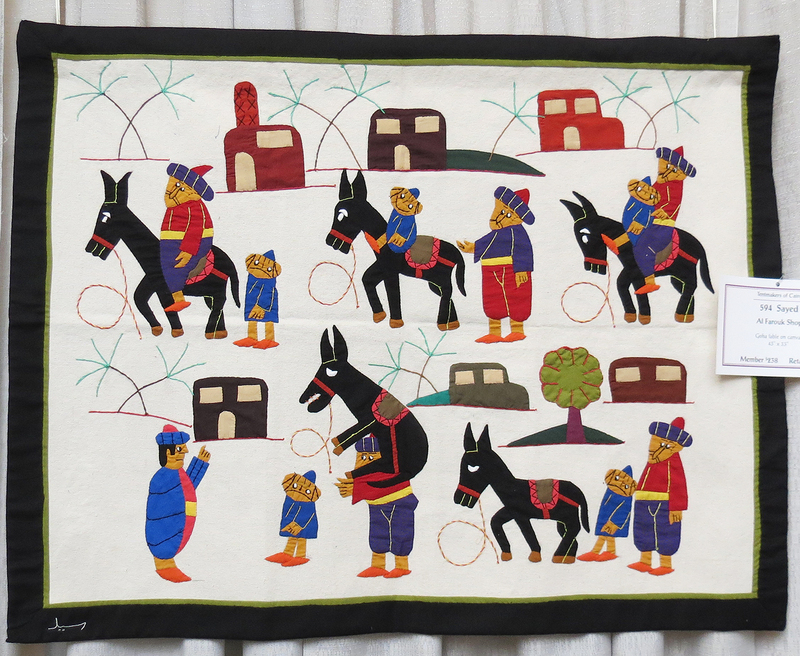 One of the quilts came home with me too. Can you guess which one? How time flies when you are having fun! Just last month, I enjoyed the wonderful hospitality of Maine Quilters, while August was much about family and friends in Colorado, our neighbor to the north. 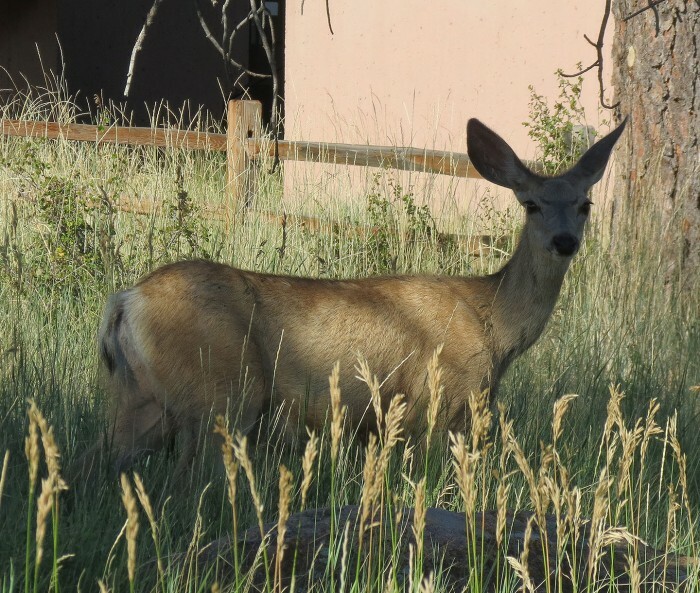 My sis, Ann Rhodes, has lived in Boulder for many years. deer. Since no hunting is allowed in the city of Boulder, open space included, the deer are remarkably unconcerned about the presence of people, so this one just gave me a quick look and resumed nibbling on the tender shoots. 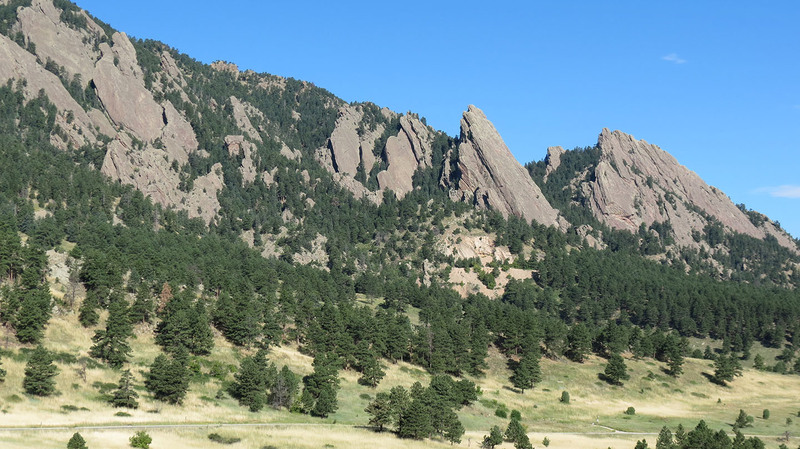 There is much to do in Boulder besides hiking! It also is home to eQuilter founded and owned by Luana and Paul Rubin. 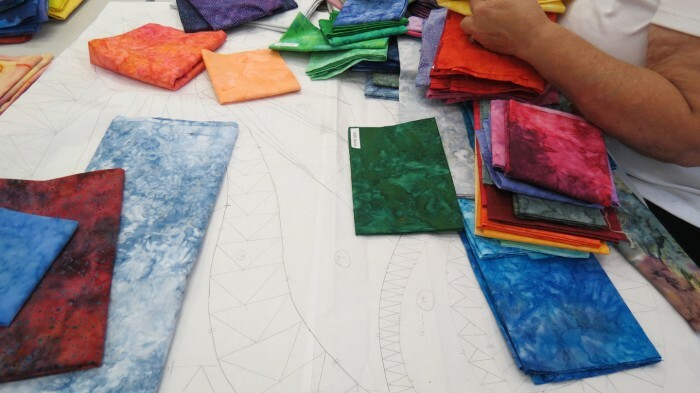 Luana’s background was in fashion design with a specialty in imports, working in New York City and traveling the world. She loved New York and the fashion industry. After she met and married Paul, they moved to Colorado to he make their home. Luana signed up for a Log Cabin quilting class and fell in love! 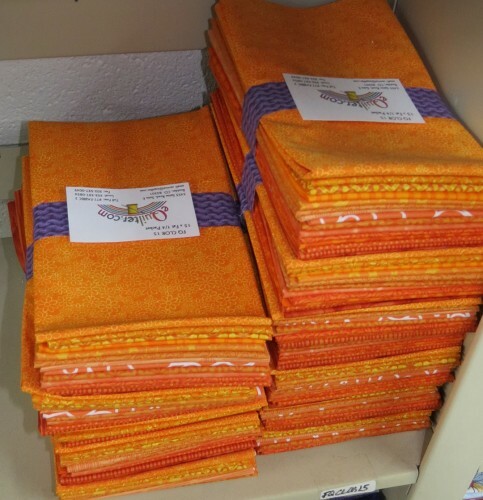 From then on, there was no looking back and she took as many classes as possible with just one problem — she couldn’t find all of the fabrics she wanted for her quilts. So, Luana and Paul started eQuilter in the basement of their home in March of 1999, 15 years ago. Paul was a web designer, who had the expertise to create their website. 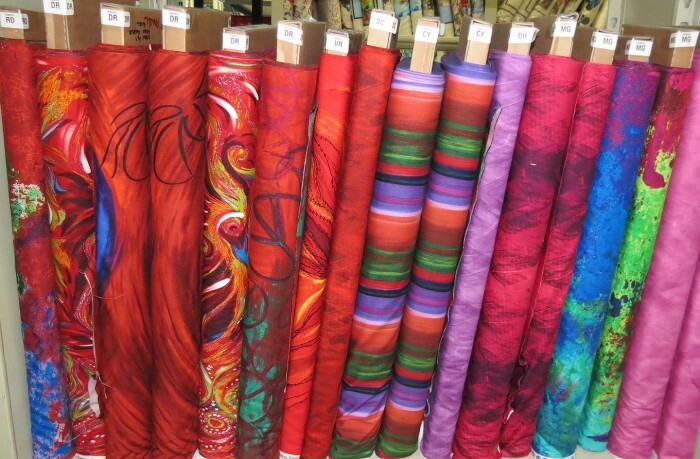 Initially, they specialized in Asian fabrics and a three year business plan. They exceeded that plan in only 60 days! 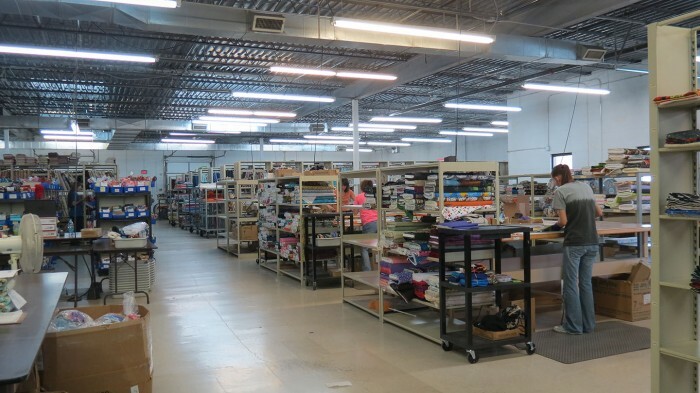 Today, their expansive warehouse holds 18,000 – 20,000 items at any given time with over 1,000 new products every month. 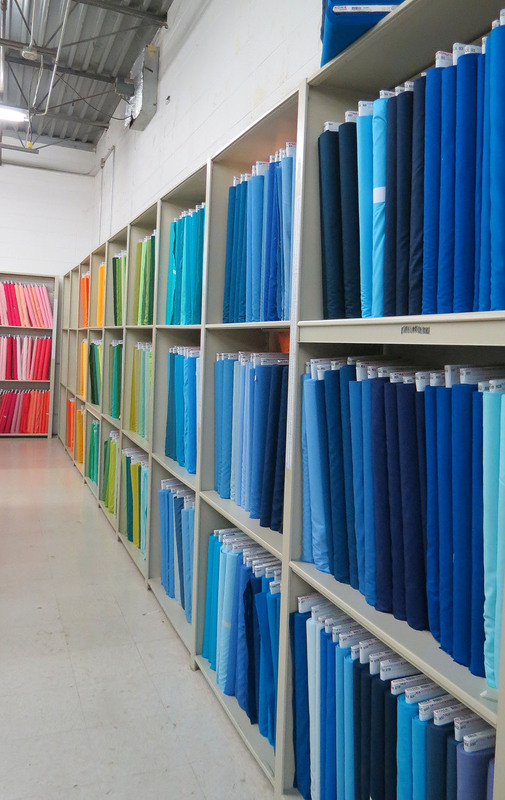 and just about every imaginable solid color in the world. 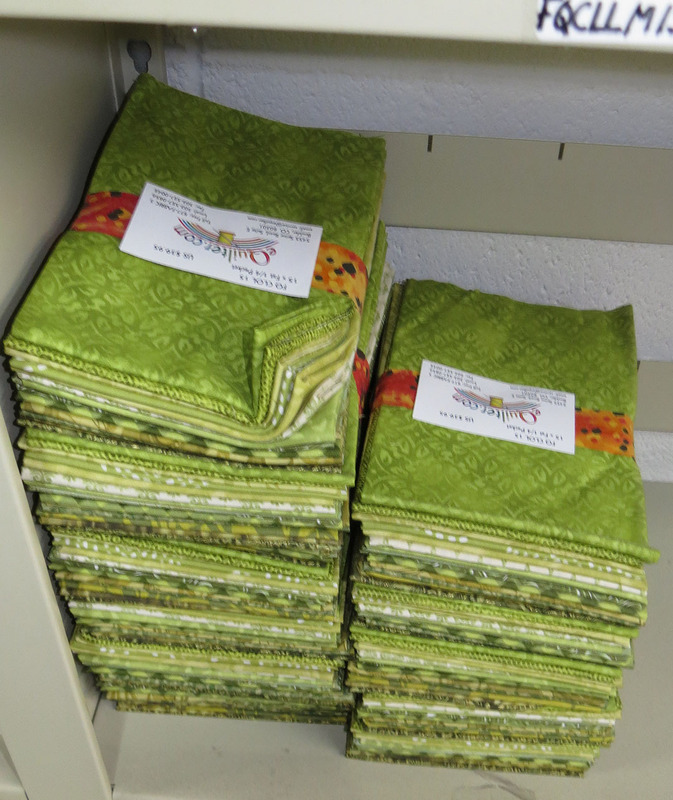 I loved all the bright fat quarter packs in lime, orange, yellows and more! 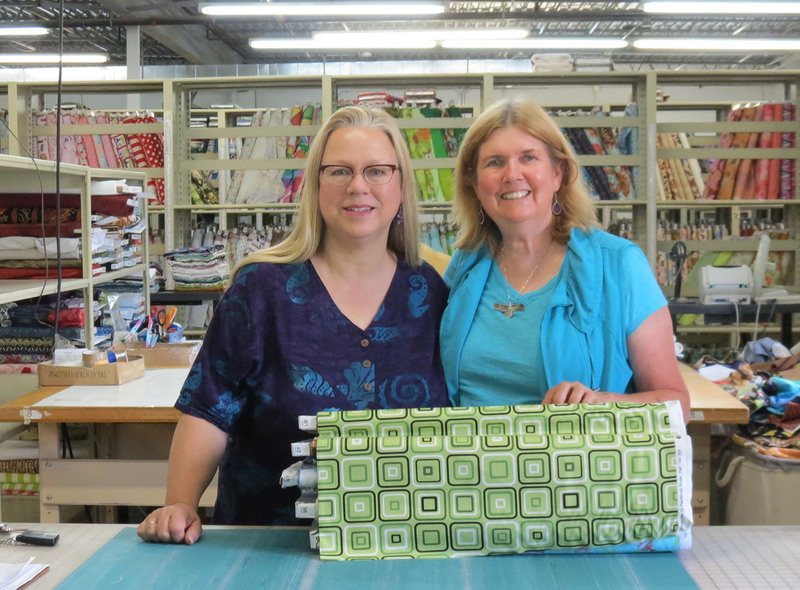 Luana and Yours Truly with a terrific bolt of fabric! After our tour, Luana and I had fun at the cutting counters, before we headed off to lunch and I learned more about this remarkable woman and the charity work of eQuilter. Stay tuned . . .
What a terrific state Maine is! It’s so very different than my home in New Mexico and chock full of adventures waiting to happen. 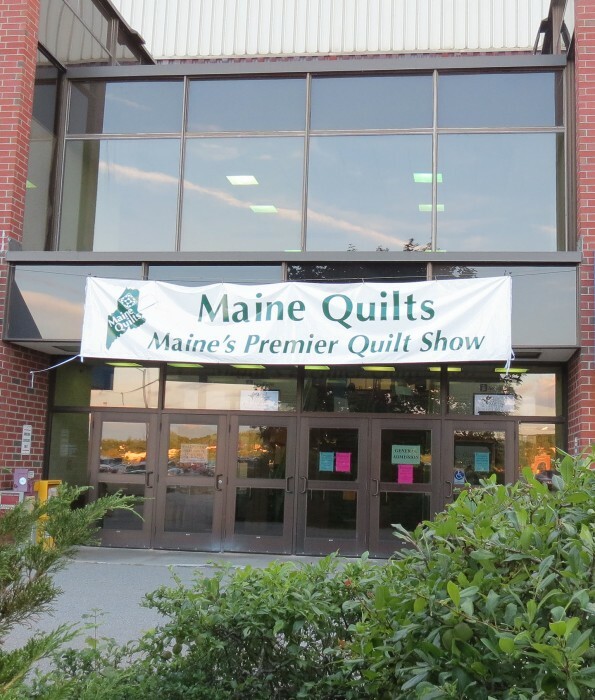 It just so happens that I am here to teach at Maine Quilts, the annual statewide show, hosted by the Pine Tree Quilters Guild, and held in Augusta each year. Augusta is the capital of Maine. The city’s population was 19,136 at the 2010 census, making it the third-smallest state capital and the eighth-largest city in Maine. The show takes place in the August Convention Center. It is a welcoming group, friendly and helpful! 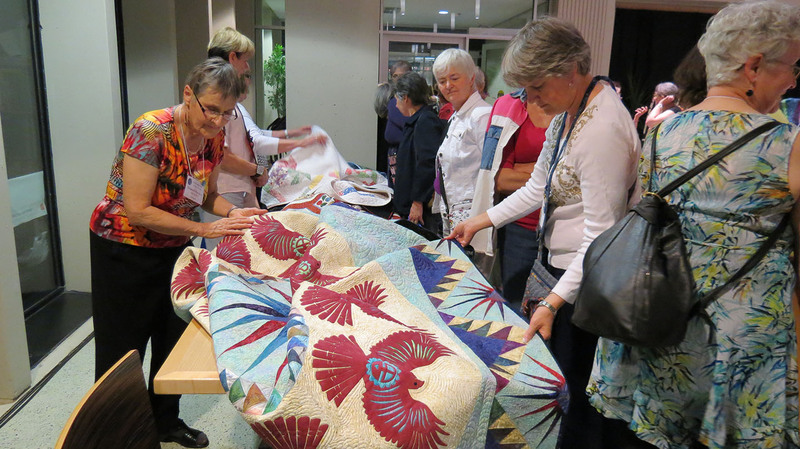 We got a sneak preview of the quilt show last night before classes began today. 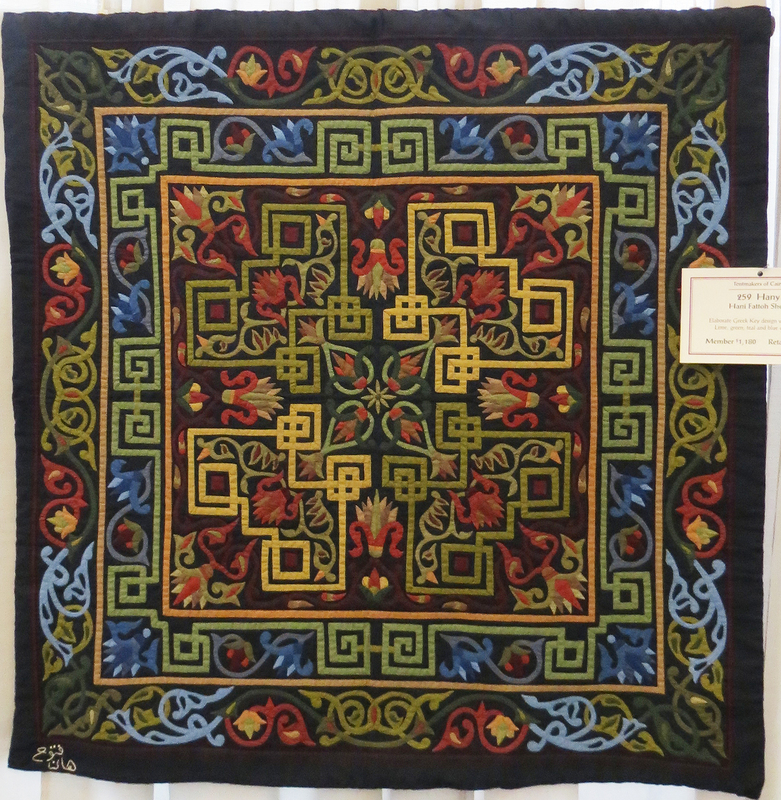 I was full of anticipation to see the quilts of the far northeastern United States. I was not disappointed. Here is a small selection. 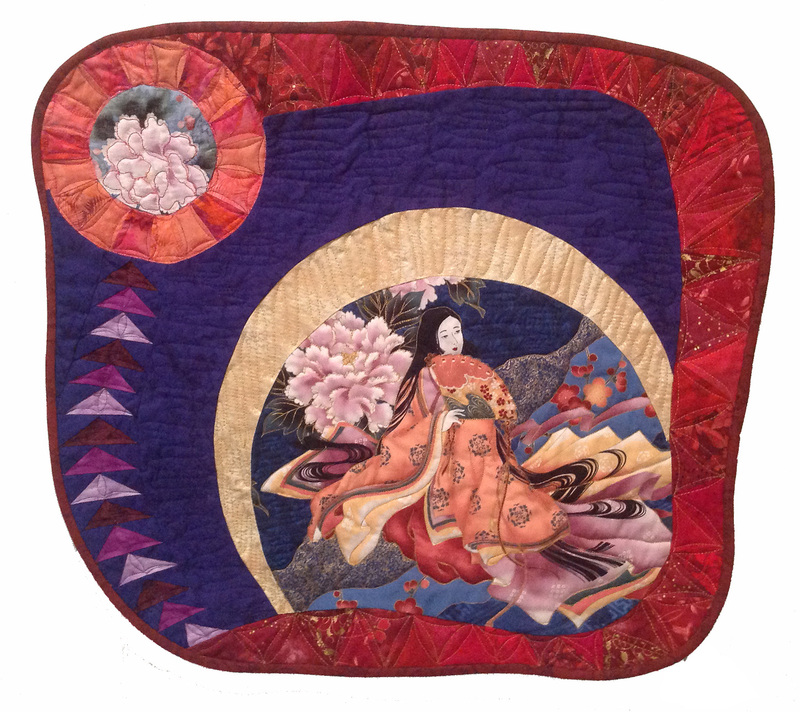 Springtime in the Geisha’s Garden, by Margaret Solomon Gunn won Best of Show. It is an amazing quilt set apart from the others by the fine use of color, the detail, and the quilting. 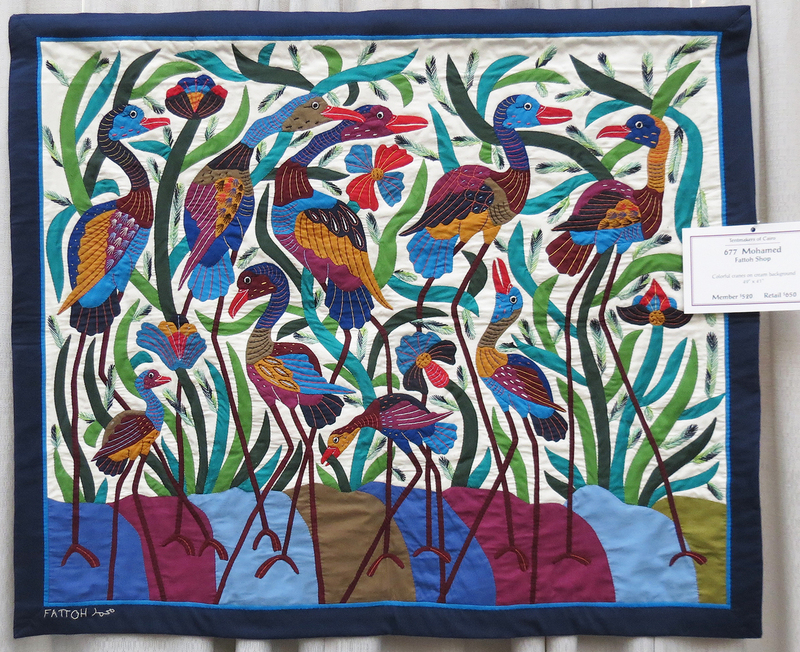 “The fabrics and original design are reminiscent of an Asian Garden. The quilt has accents of silk fabric and silk embroidery. 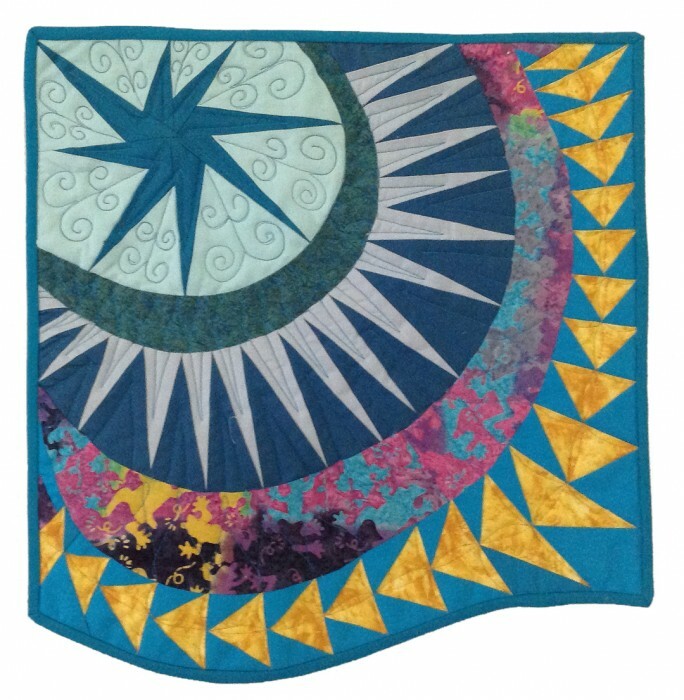 The quilting designs are free-handed and the quilt includes hand applique, hand and machine piecing, hand embroidery, embellishment, and is machine quilted. 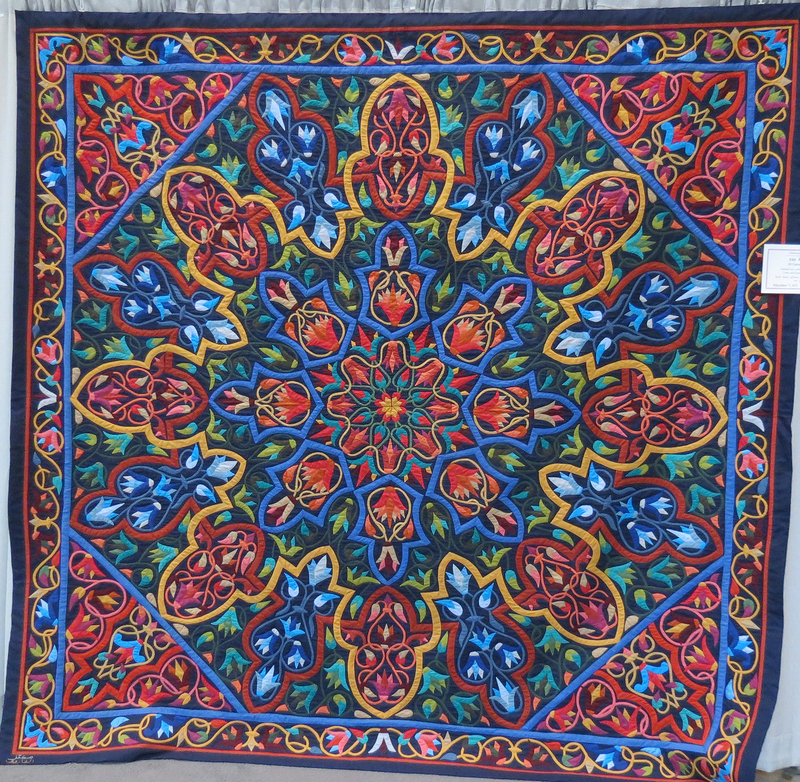 Here’s a look at the back of this magnificent quilt. 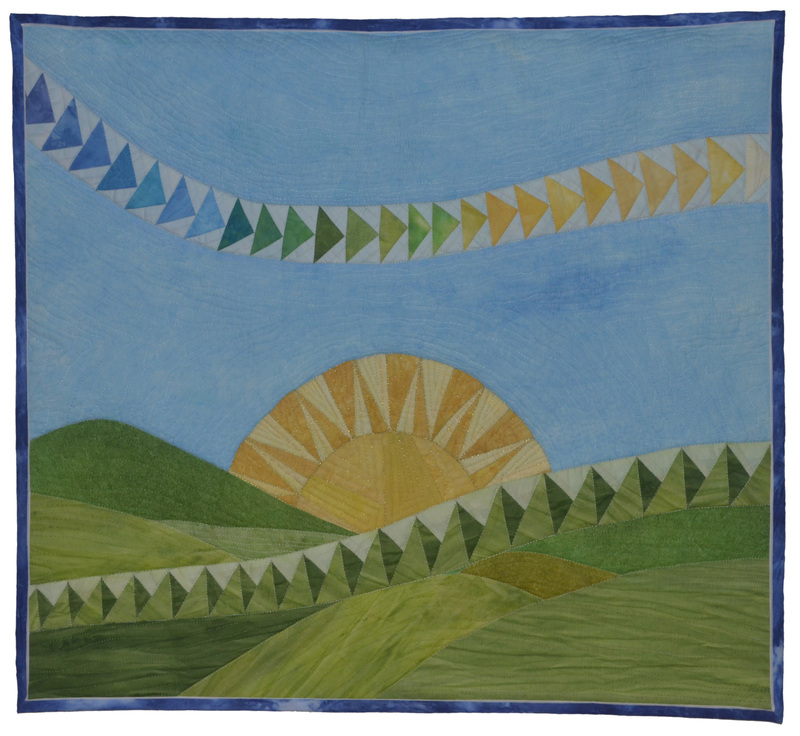 Except for this quilt, the others in this post are all bed-sized quilts and winners in the juried show. 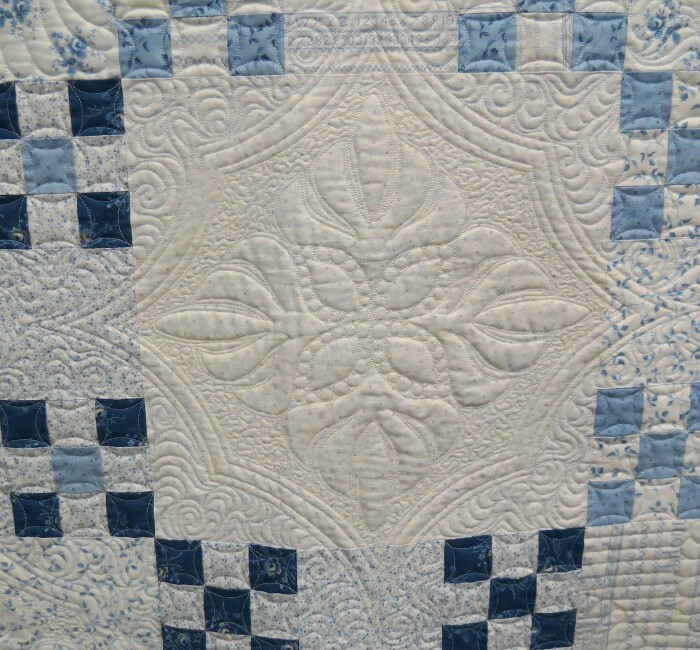 Lotsa Lemoynes was created by piecing the center section, placing it on point and then filling in the corners. 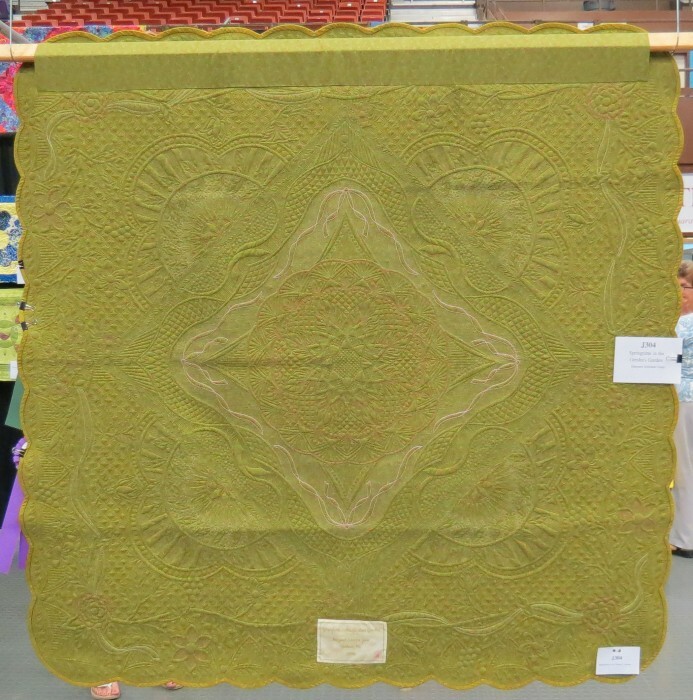 Daniel Perkins says that the quilt was created using Studio 180 design’s Rapid Fire Lemoyne Star tool and techniques. It is an original design, machine pieced and quilted by Daniel and Carol Perkins. The quality and intensity of quilting in all of the award winners was simply astounding. 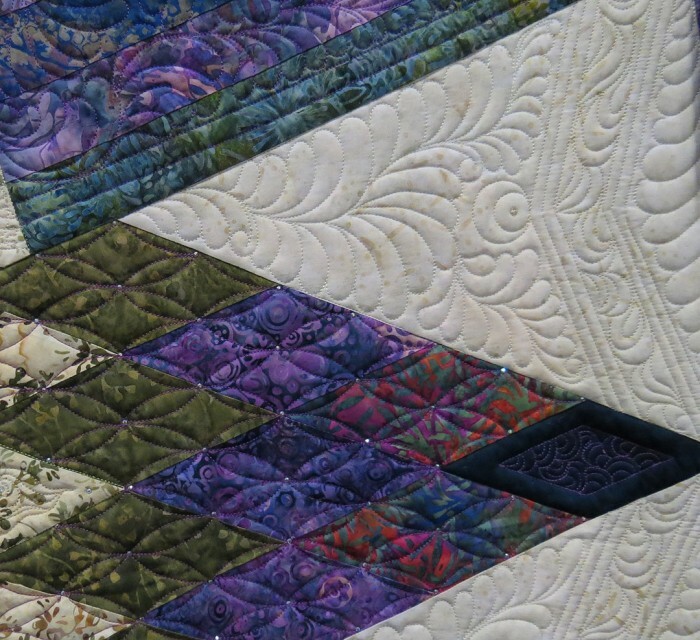 Sadly, the aisles in the show were not wide enough to capture the entirety of the large quilts, so these are cropped. 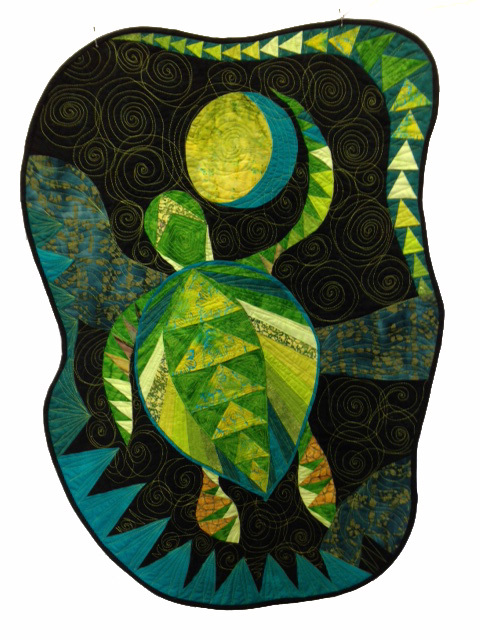 LZ8, by Sharleen Fields, was named for the landing zones used in Vietnam to ‘dust off’ the troops. Sharleen writes, This looks like 8 birds (i.e. helicopters) heading in to land. My husband, a Vietnam veteran, helped me pick out some of the colors. The source is “Amazon Star” workshop taught by a certified Judy Niemeyer instructor. 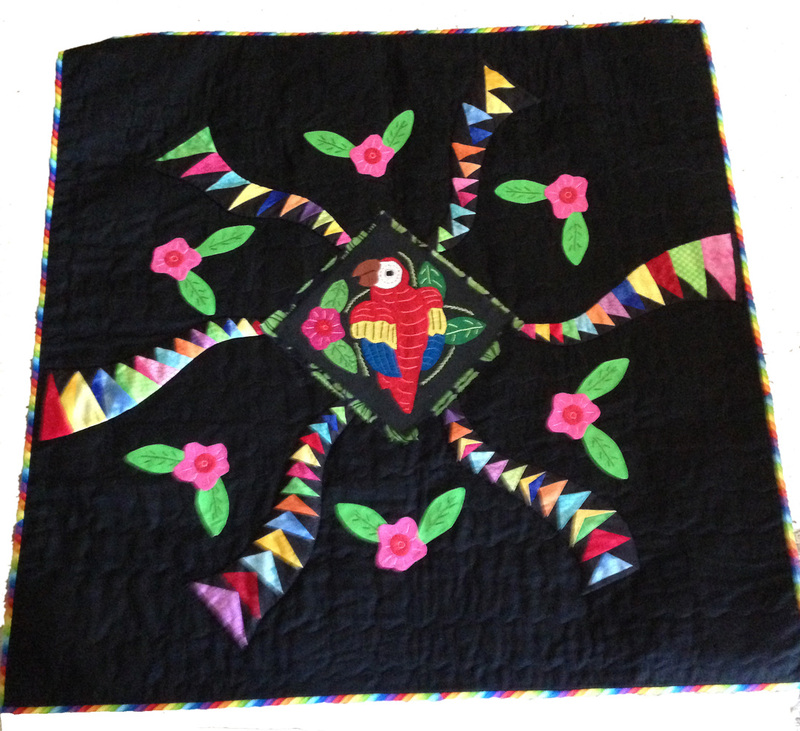 It is paper pieced, hand appliqued, and . . .
professionally machine quilted by Margaret Solomon Gunn. Lovely! professionally machine quilted by Margaret Solomon Gunn. 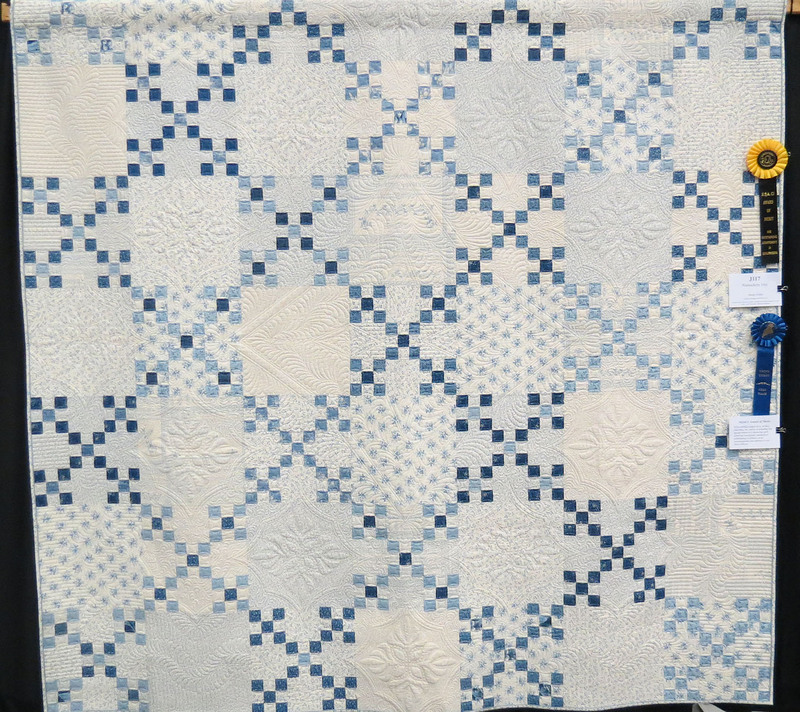 What struck me most about these first quilts was the way the quilting complemented the designs, enhancing the the piecework and applique. 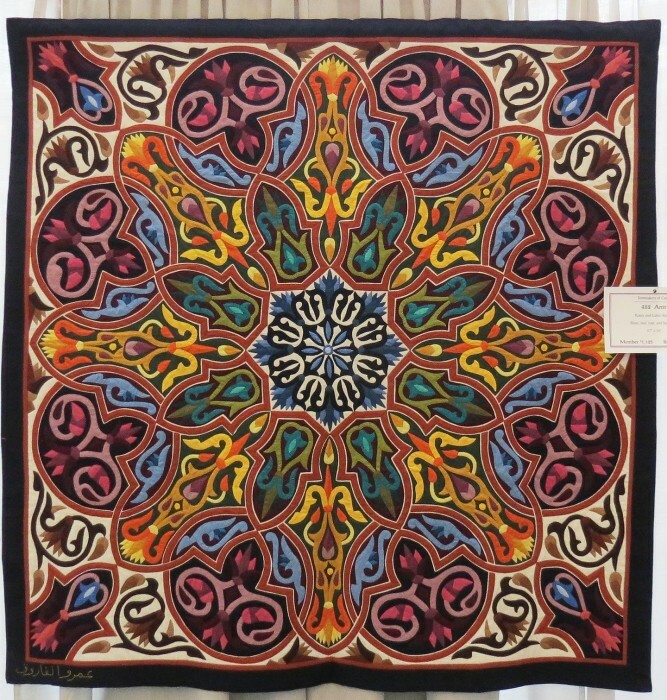 As I was processing these images and looking them up in the show catalogue, I noticed that three of the four were all quilted by Margaret Solomon Gunn – she is one heckuva great quilter! I meet the most interesting people in class. Such was the case when I was teaching at Quilt Canada in St. Catharine’s, Ontario. Veronica Puskas was my assistant in class and what an assistant she was! We hit it off immediately and, although I often lack a helper in class, Veronica soon became indispensable. During breaks in the day, I learned more about this remarkable woman. 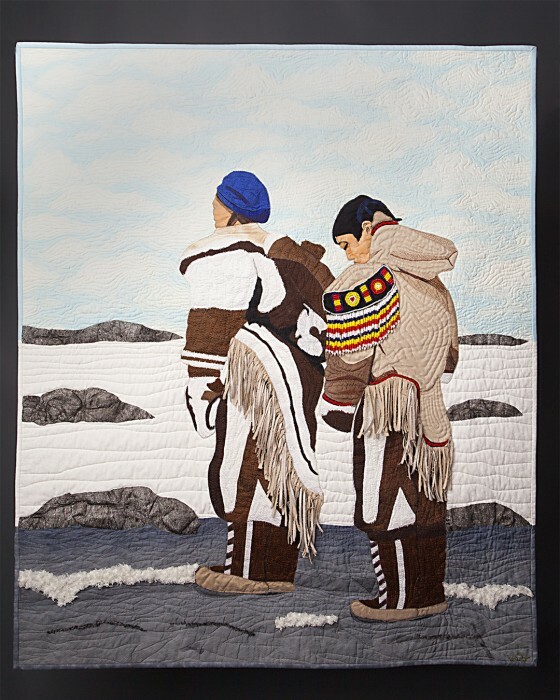 A former resident of Nunavut and the Northwest Territories who grew up in Nunavut’s Kivalliq region,Veronica won the award for Excellence in Work by a first-time exhibitor award at Quilt Canada’s national juried show. 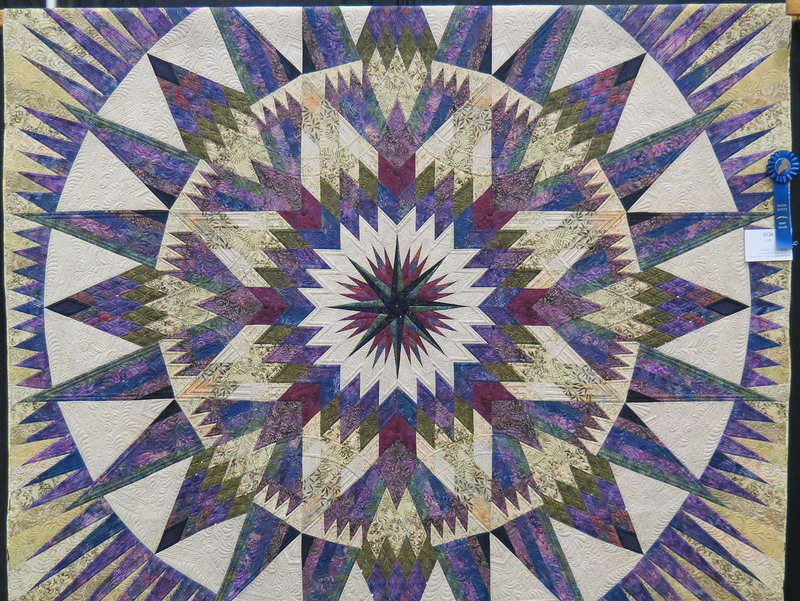 I saw her amazing quilt in the exhibit and she later send me a photo. Veronica has this to say of “Pillars of Strength”, I designed it from a 1950 photograph of my Mom and Gramma, taken near Rankin Inlet, Nunavut. It shows the difference in Inuit traditional clothing between a married woman and a teen-ager. Notice the flaps. 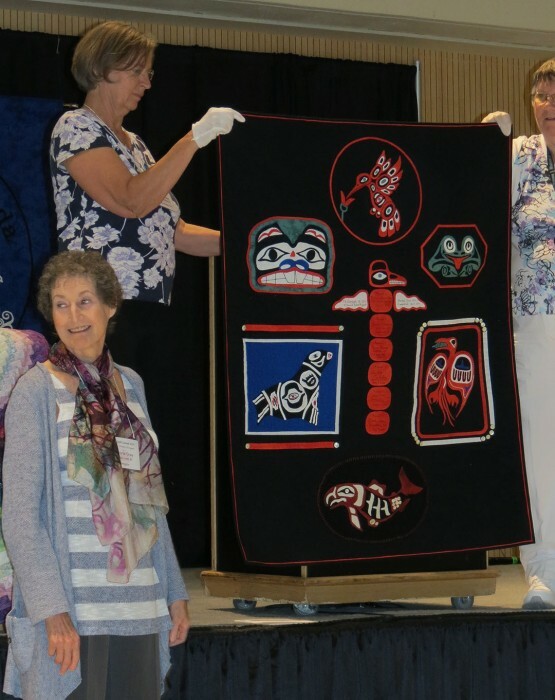 After fusing the applique to the quilt top, I did some thread painting on it as well.” CBC North and Nunavut News published an article about Veronica and her quilt, rich in the cultural heritage of her family. 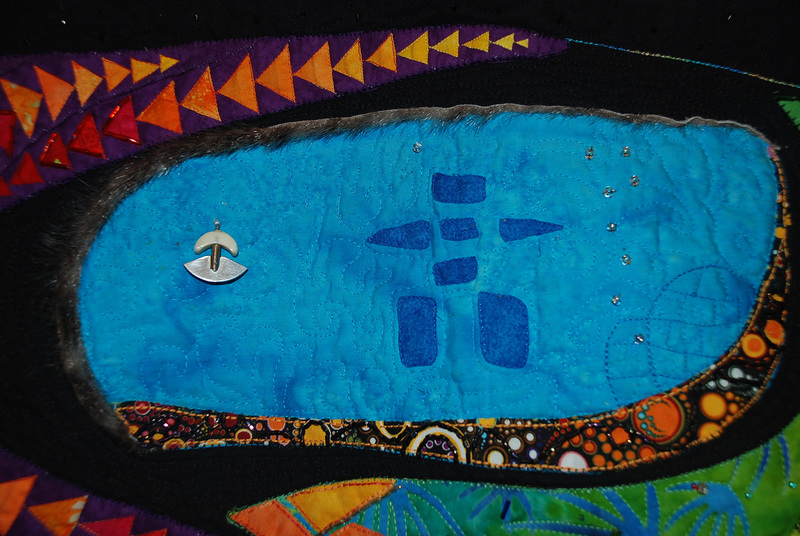 The detail image above shows the sealskin trim, the ulu, and the Inukshuk. An Inukshuk is a stone landmark or cairn built by humans, used by the Inuit, Inupiat, Kalaallit, Yupik, and other peoples that travel the Arctic region of North America. These structures are found from Alaska to Greenland. 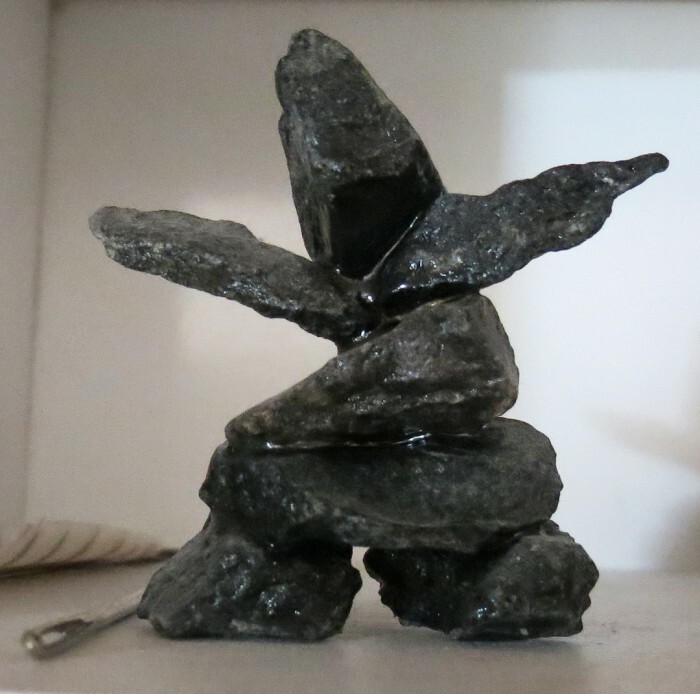 Above is a small Inukshuk that I purchased when I was teaching in Yellowknife, Northwest Territories, several years ago. I fell in love with the remote sub-Arctic landscape, beginning to understand the challenges of traversing the mostly featureless landscape. 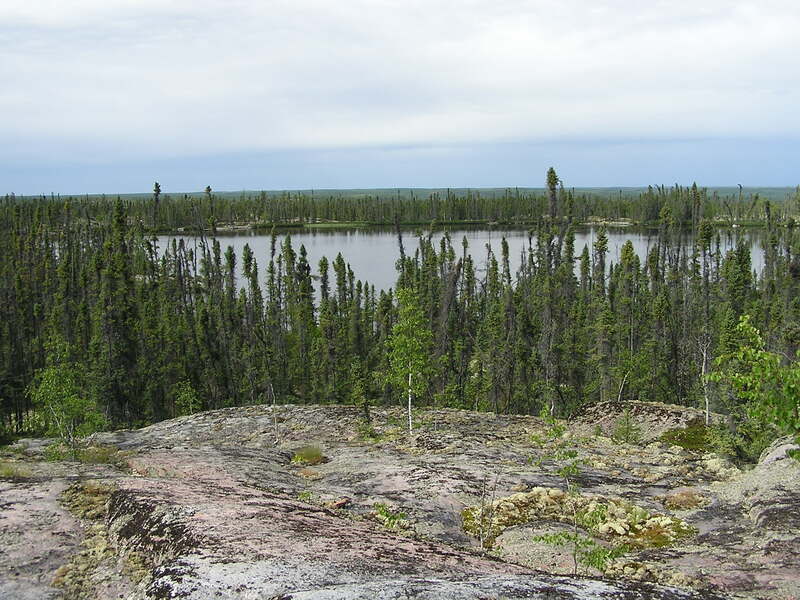 I was told that one should look through the openings of in the Inukshuk to see the next cairn in the trail. It left me with wonderful memories of a beautiful land and my new friend, Veronia Puskas. The Best Part of My Job is YOU! Without a doubt, my email box is better than checking the mail box outside! 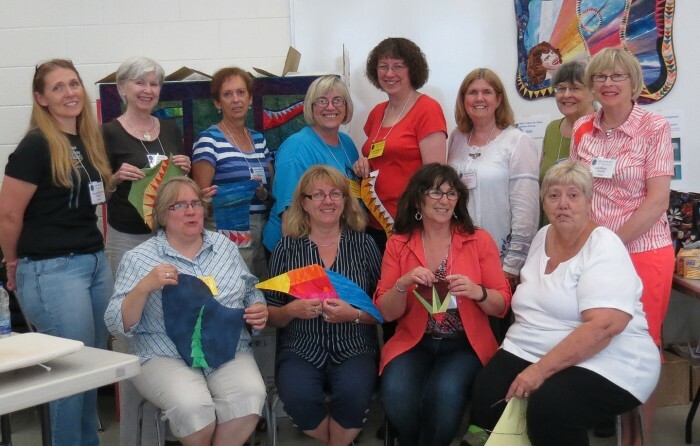 I’ve just returned from Ontario, where I taught for the Lanark County Quilters in Perth, about an hour south of Ottawa. 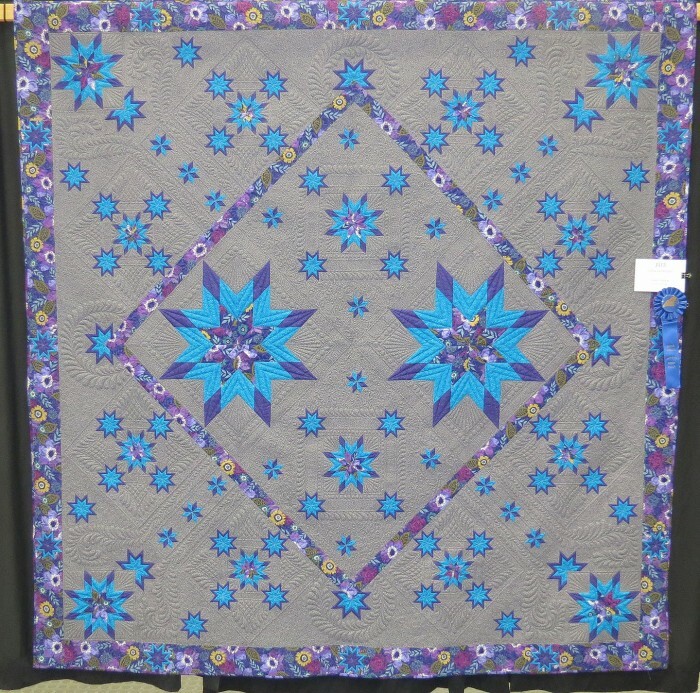 Check out the first three quilts in this post! 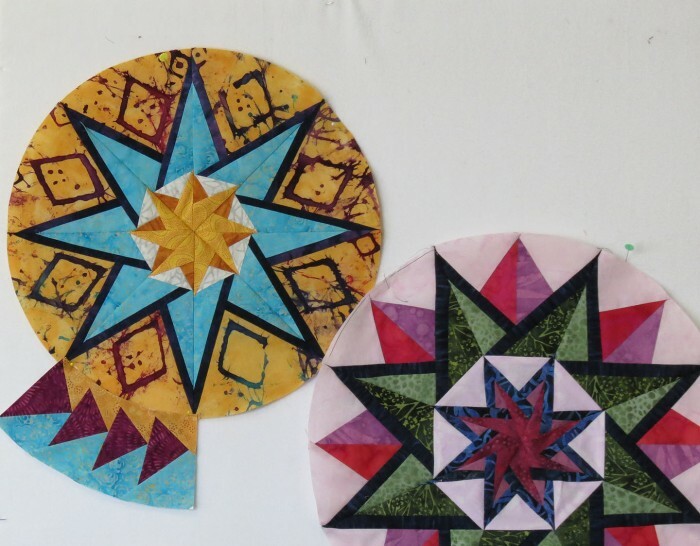 Alexis Mongeau is new-ish to freezer paper foundation piecing and look what she created in less than three weeks, a marvelous, original design. Valetta was in the same class in Perth, also new-ish to freezer paper foundation piecing. 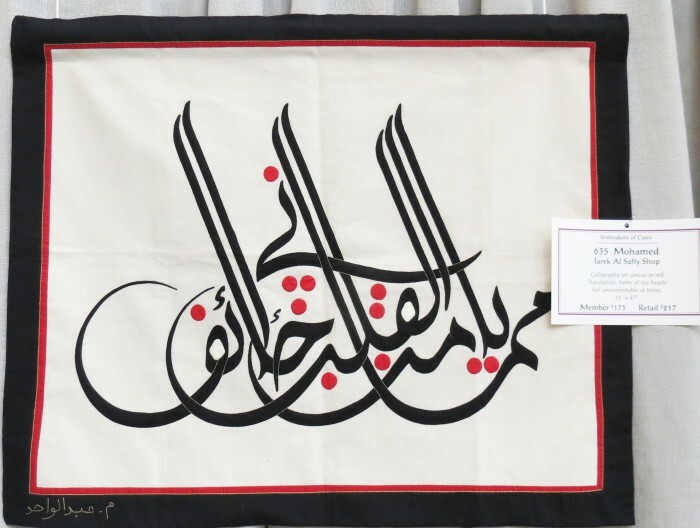 She chose to use the free-form fillers to feature and enhance the oriental woman in one beautiful piece of fabric. It’s gorgeous! Then, just today . . .
Valetta sent me another photograph! This time, she made one block of the Wheel of Fortune pattern in my book, Flying Colors. Simply Superb! 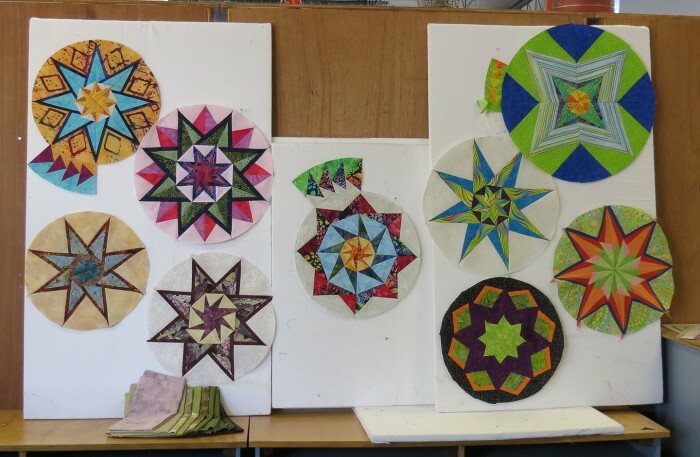 But, I also have received several more images of student works. Check these out below! Carol Hesse took my class at Quilting in the Desert in Scottsdale, AZ this past January. I just love the contrast in her pieced filler strips, particularly the Mountains and Valleys filler. 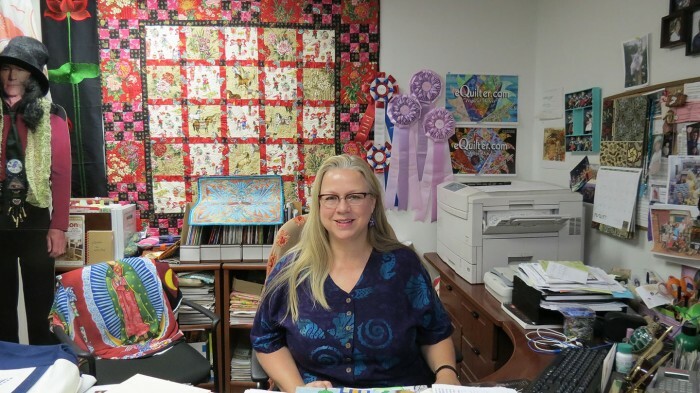 Vivian was in my class at Houston’s International Quilt Festival a while back. I love the movement that she got with the strategic placement of fabrics. What a joy it is to see where you take the techniques learned in class! Some of my best friends in the world are people I meet in quilting classes! Keep those pictures coming! Day one began like all of my design classes with a series of exercises. Then students moved on to drawing their own designs. Once satisfied with a design, colors and fabrics are selected for the portion of the quilt that the student chooses to begin working on. Cutting the fabric comes next, after a short demo about how to determine what sizes to cut individual pieces for freezer paper foundation piecing. The next step is to use Freezer Paper Foundation Piecing to stitch the individual filler strips. The border above is called Dashing Sunrays. Above is the 10,000 Pyramids border, my absolute all time favorite. And, above, already stitched to a background piece is the filler strip called Mountains and Valleys, another of my favorites and very popular in class. 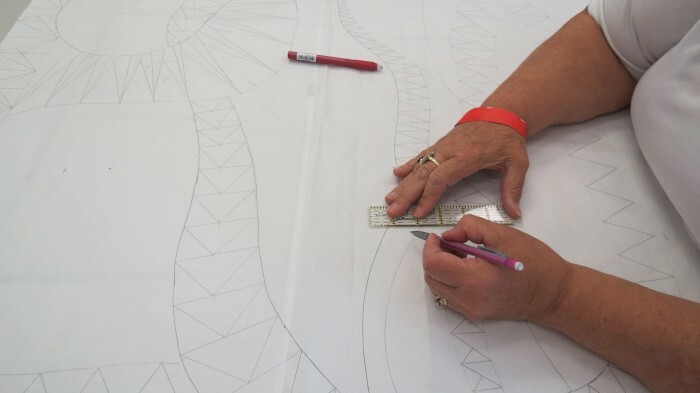 By the end of day two, some students, like Fran Sayles, have accomplished major portions of their designs. This one is going to be a beauty! 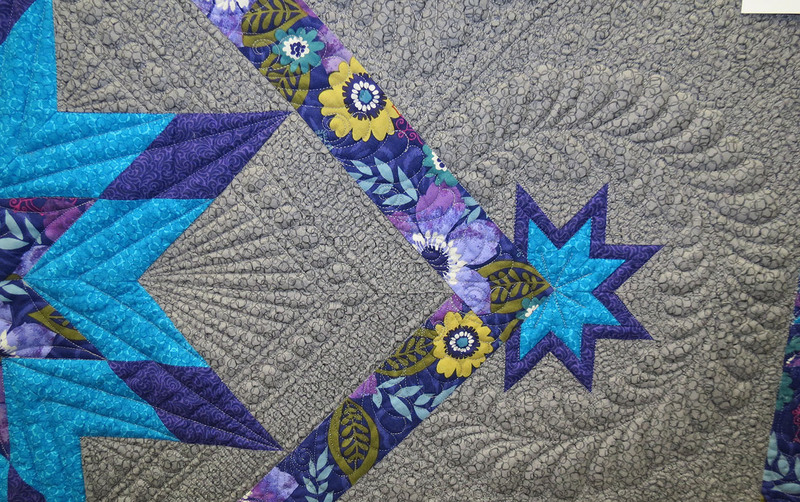 Do you recognize the top border in Fran’s quilt as the 10,000 pyramids border shown above? In the end, we all had a marvelous time! 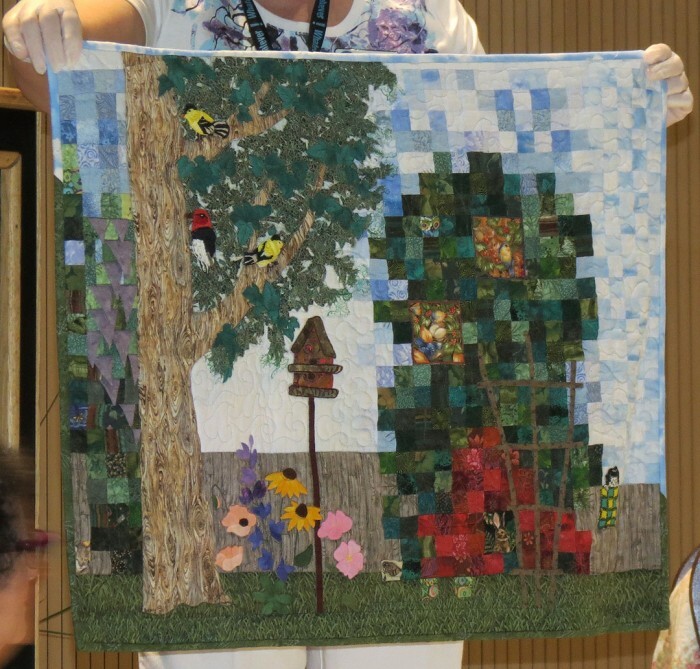 I can’t wait to see where these talented quilters go with their new skills! Thank you all for being such lovely students! 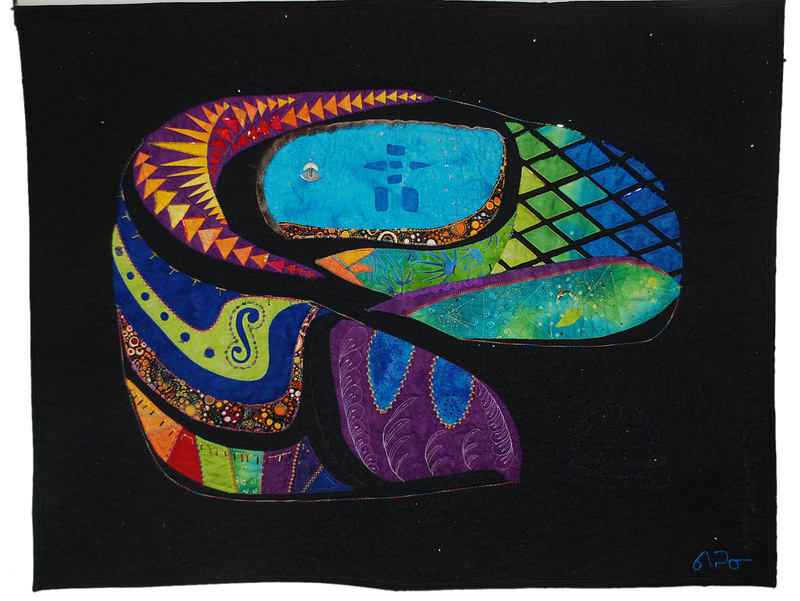 What a thrill it was to be included as a faculty member of Quilt Canada, their national show. Hosted by the Canadian Quilter’s Association (CQA), it features some amazing quilts in several different exhibits. 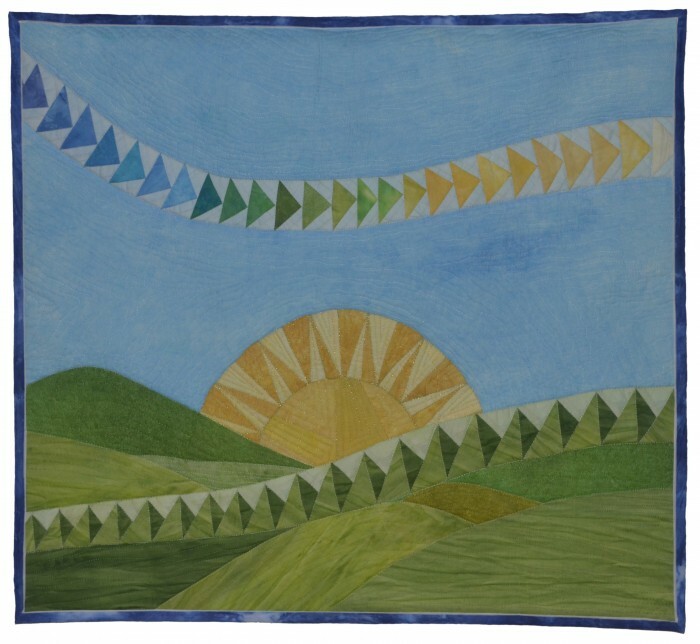 The quilt above, “Don’t Worry – Be Happy” was created by Marianne Wiltse and it was her first entry into the juried show. It is published here with her permission. Sadly, the rules of the juried show preclude cameras and the images on the DVD which can be purchased cannot be used except for personal use. 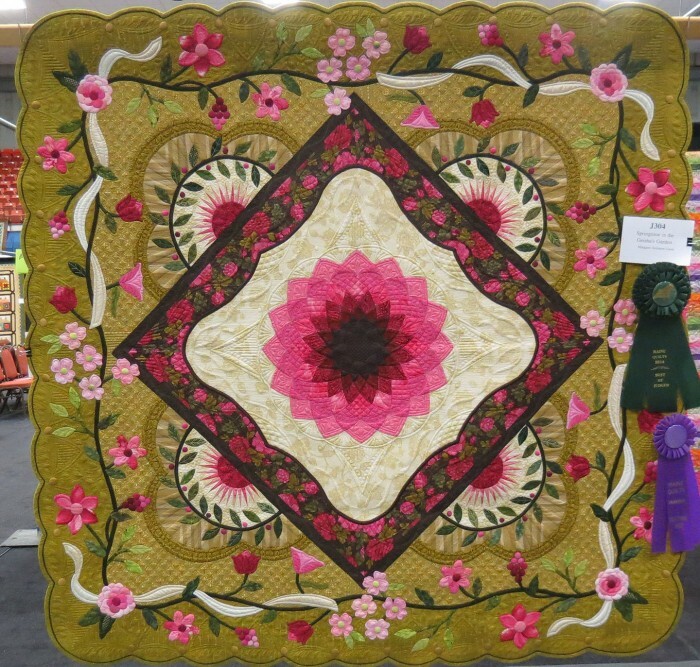 So, I can’t show you any of the other beautiful quilts, but you can see the winners on the CQA website. In upcoming posts, I will show some of the other exhibits that can be photographed. Marianne hails from Calgary, one of the most beautiful places on Earth. She and her mom were both students in my two-day Goose is Loose Class. What creativity they have! 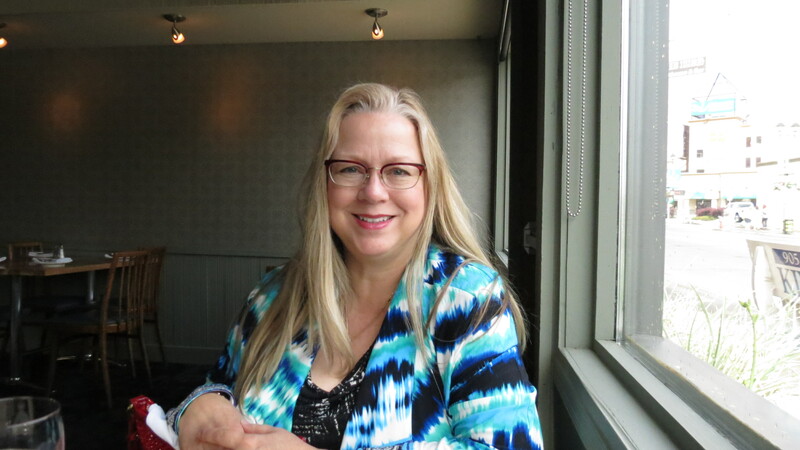 Luana Rubin, owner of E-Quilter, one of the coolest online quilt shops ever, and I drove down to Niagara Falls for dinner. We supped at Four Brother’s Cucina a charming spot where the pasta is homemade daily. Family owned and operated since 1964, it was a good choice. 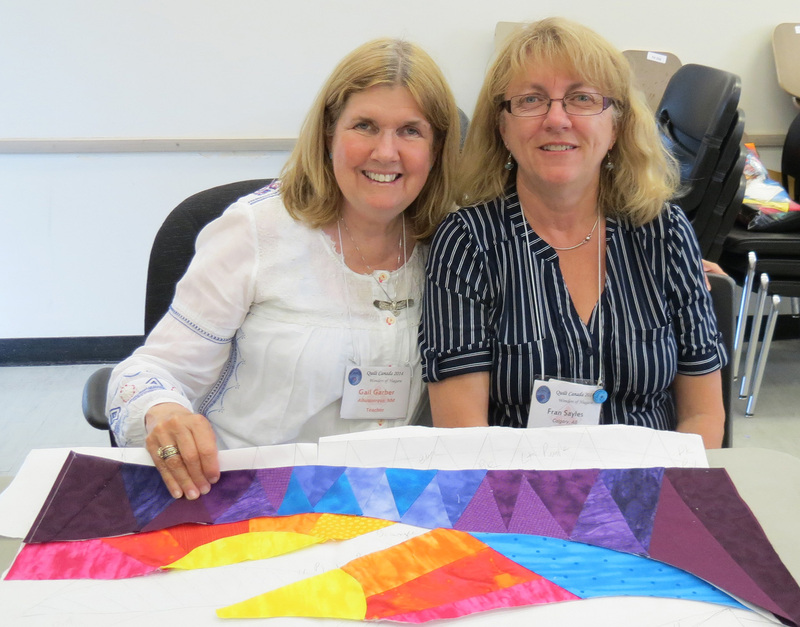 Then, we headed back to Brock University, host for Quilt Canada 2014. It was show and tell night. and she even did a little twirl to show off the skirt of the ensemble. I took a lot of photos during show and tell but was off to the side so everything was photographed at an angle and I was unable to get the names of the makers. I’ve included just a few here. I also brought the Hawks Aloft raffle quilt for Show and Tell so I could share the story of our quilt-in-a-day quilt retreat. Afterwards. several ladies came up to examine our handiwork. What a great start to a terrific show. This is another of my favorite classes to teach. By the second morning of class, almost everyone showed up with a nearly completed star. Then it was time to design the borders. Above, by using two different colors as the background of the geese, it creates a saw-tooth edge around the center star. Above is a selection of stars in progress from class. Aren’t they beautiful? 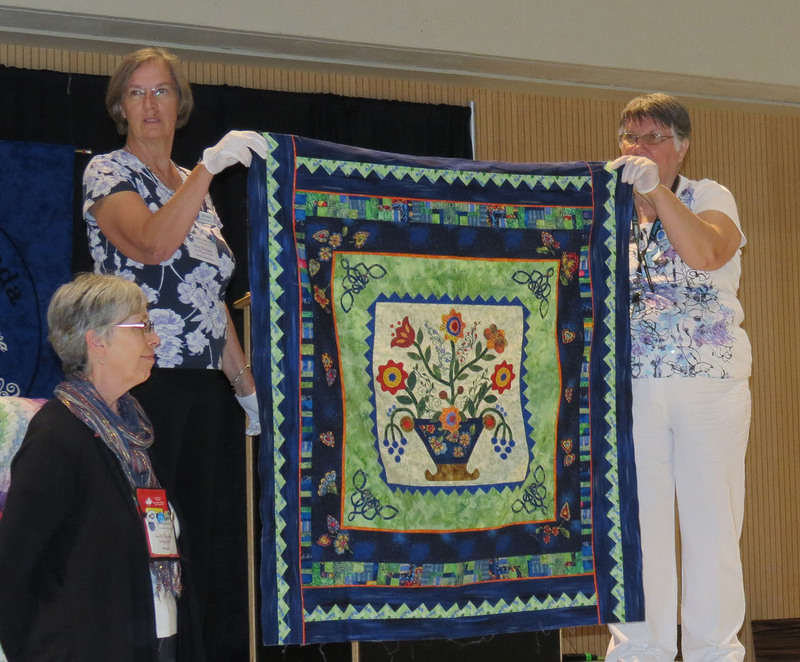 Sylvie, who had driven the 8 hours from Val-D’or, Quebec, had brought a second finished quilt from the class she took with me in Phoenix. 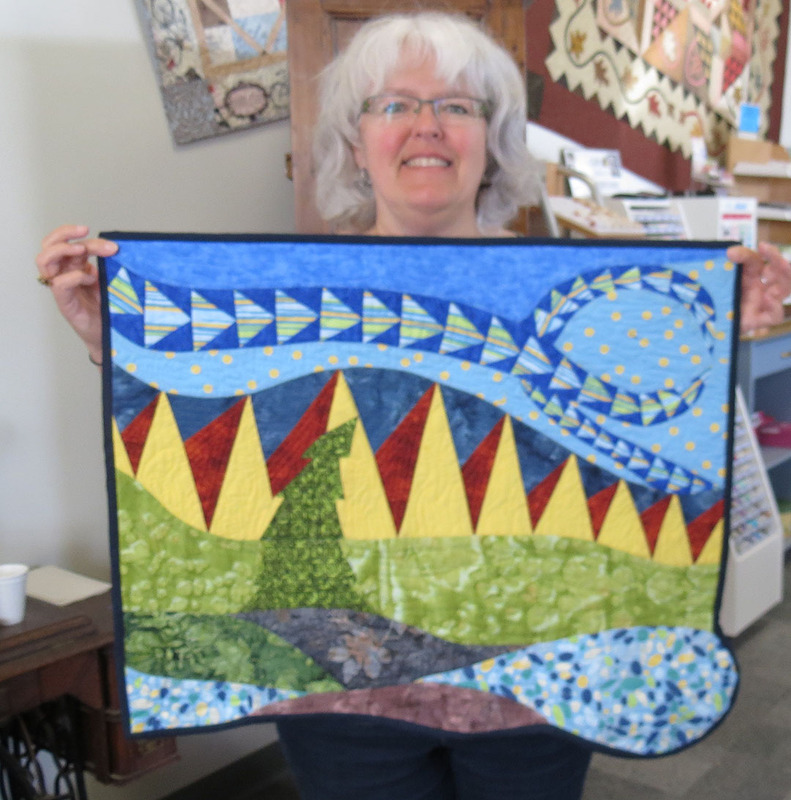 She gets a lot of quilting done up there in the far north! 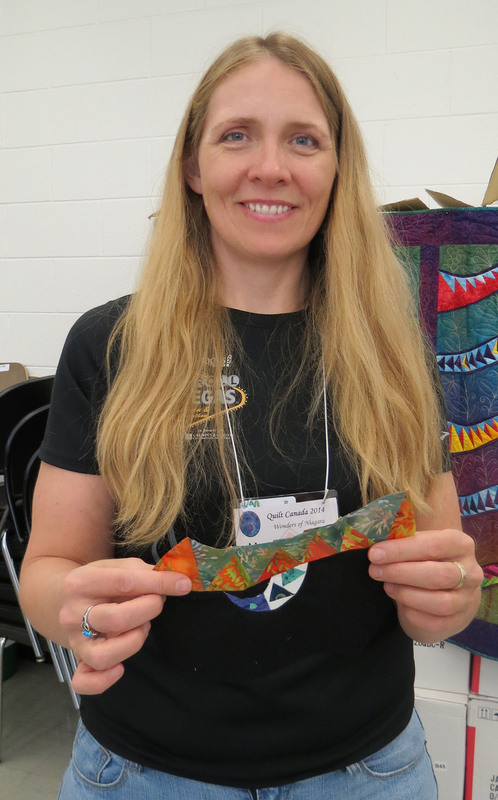 At the end of class, I was surprised by the gift of a fused glass plate and a card signed by everyone in the class! What fun we had! 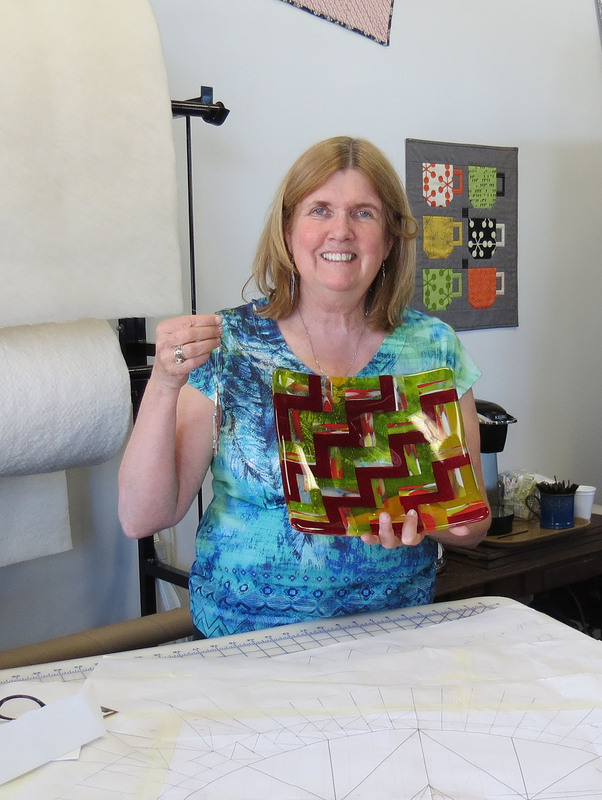 Ann is a professional glassmaker and has a website, “Sawdust and Glass” where you can see more of her work as well as that of her husband, Ron, who specializes in wood designs. 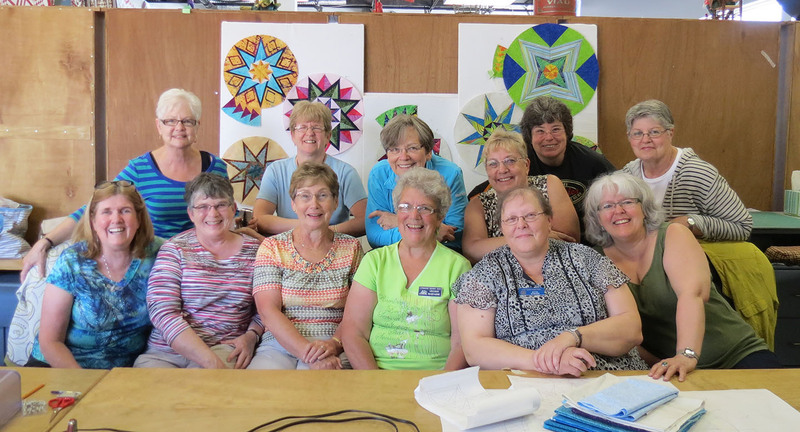 Thank you Limestone Quilters, for showing me how much fun we could have in class! I love your designs and your hospitality!